Little Mrs. Married: Five Question Friday! 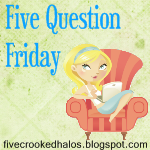 Well, it's Friday - time for 5QF - Five Question Friday! If you want to play, answer the below questions in your own blog. Then go to Mama M's & add your link to the blog hop (it'll tell ya how)! Back before i started driving, i was on the way home with my sister (the driver) & our 2 neighbors (who are siblings). The neighbors lived 3 houses after our house. So we're bringing them home & before we passed our house, my sister hit an armadillo. So i was okay & then we brought the friends home. We were turning around to go back home & i said, "let's go look at the armadillo just to see if he's okay." UM BAD DECISION! He was on his back wiggling his hands & feet... omg... sorry to put that image in your head. I started SOBBING. When i got home, mom saw my face & thought the end was near or something. She was SO MAD AT ME that i was crying over an armadillo! HAHA. Another time my sister hit a bird (head on collision - it flew into the windshield as she was driving) & another time my mom hit a cat. I never hit anything but i swear - I've almost hit a deer. And i've almost hit PEOPLE because OH MY GOSH people just roam the streets at night in the dark - GRRRR! 2. When you see a string on your clothes do you pull it off or tear it off? Tear it. Even if it's new. I happen to be the master. My mom used to freak & my husband kind of freaks now & runs to get scissors. But i haven't ruined anything yet. 3. Did you have your own room or share your room when you were young? I had my own room. Except one year, my junior year of high school when we had a foreign exchange student from Ecuador. I begged & begged for a foreign exchange student (yes, i know it sounds like i begged for a puppy. But it was a girl named Piki & she was in between me & my sister's ages & i LOVED her. Still do but haven't seen her since then. She's a doctor now!) Anyway, so the year we had Piki is the only year i shared a room, until i got married. I agree with Mama M - this question is unfair! I mean, i like variety in my diet. And i also like variety in my closet!! I don't know what to dooooo. I guess... i'll take choice A if i must choose (wear the same thing). 5. What was your favorite show as a child? I loved Today's Special! Remember that one? And I loved Garfield and friends. So much that i recently added it to my netflix. We got it in & somehow it wasn't as funny as back then. I still love Garfield, though. Haha I am the exact same on number two...my mom always HATED it when I did that! PS - I love your blogs. BOTH of them! OMGosh Today's Special!! We didn't have cable so I would go to my neighbor's house to watch it. I loved that show! Funny how you & I were both crying over armadillos. Poor little things!